Opiate withdrawal is an intense experience. Common withdrawal symptoms include unpleasant afflictions like hot and cold chills, body aches, insomnia, restlessness, diarrhea and lethargy. You may also suffer from cravings, anxiousness, depressed mood, and many other mental and physical symptoms. Home remedies for opiate withdrawal include staying hydrated, taking a pain reliever like acetaminophen or using Imodium to treat diarrhea. However, an opiate withdrawal supplement that is manufactured to treat the majority of the opiate withdrawal symptoms may be a better option. Properly formulated supplements can cushion the symptoms of opiate withdrawal. 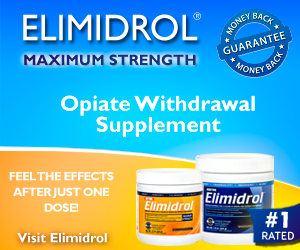 Elimidrol is the #1 rated opiate withdrawal supplement and its clinically proven ingredients are designed to relieve the severe mental and physical symptoms that accompany opiate withdrawal. Elimidrol is non-habit forming, so you won't be transferring your addiction from one substance to another. The supplement's maximum strength formula has contributed to a very high success rate with an overwhelmingly positive response. Elimidrol will decrease the symptoms of opiate withdrawal to a more comfortable and manageable level. Elimidrol provides a level of relief and effectiveness that is unmatched by any product in the industry, and has become recognized as the #1 Opiate Withdrawal Supplement. That is why Sunrise Nutraceuticals, the manufacturer of Elimidrol, stands behind their supplement with a 100% money-back guarantee to provide consumers peace of mind. Elimidrol comes in powder form to ensure maximum effectiveness and fast acting relief. You can use the supplement whether you’ve decided to gradually decrease your reliance on opiates or quit them cold turkey. People experience success with either opiate detox method. The supplement comes in a daytime and nighttime formula. Both versions have 28 servings, which is typically a four-week supply. That does not mean, however, that you have to take Elimidrol for four-weeks but rather those servings are there to ensure you have extra servings if necessary. If any day is particularly more difficult, you can take extra Elimidrol servings for additional relief. Elimidrol effectively alleviates withdrawal symptoms that arise from all opiates and opioids, including narcotics, generic drugs, and brand name medications. This includes (but is not limited to): Oxycodone, Heroin, Percocet, Vicodin, Opana, Dilaudid, Methadone, Suboxone, Subutex, Oxycontin, Roxicodone, Fentanyl, Morphine, Hydrocodone, Lortab, Hydromorphone, Oxymorphone, Codeine, Opium, Ultram, Tramadol, Buprenorphine, Ms-contin, Demerol, and Meperidine. Opiate detox at home with help from Elimidrol. Elimidrol is safe to use, highly effective, and provides powerful relief from the first dose. Click here for more information about Elimidrol!